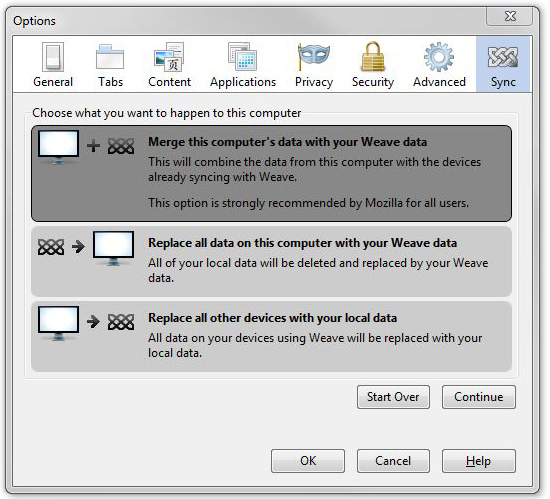 Mozilla Labs has developed a new add-on for Firefox called Weave. It syncs your Firefox history, open tabs, bookmarks, and more to the “cloud.” If you own multiple computers, and have Weave installed on them, then any changes to your browsing history, saved passwords, bookmarks, and even the tabs you had open will be reflected on all of them. Unfortunately it does not support syncing of add-ons, so your extensions, themes, and plugins will not be synced. Despite that, it’s still a great tool. Plus, since all the data is synced with the cloud, you can use Weave as a backup utility for Firefox as well. It’s especially handy in the case of a PC crash or when reinstalling an operating system. Weave is similar to another add-on for Firefox called Xmarks, formerly Foxmarks. While Xmarks is cross-platform application that keeps bookmarks synced on Internet Explorer, Firefox, Chrome, and Safari; that’s all it does, bookmarks. The ability to save open tabs, saved passwords, browsing history and even ‘Awesome Bar’ data makes Weave truly appealing. I have been using Weave since the early beta days without any problems and just recently it has been upgraded to version 1.0 RC2. It’s definitely getting closer to the 1.0 release. I recommend that anyone with multiple machines give Weave a try! I am one of the person using multiple computers and I use delicious bookmark Firefox add on to sync my bookmarks. This add on is a boon to me. I wanna try it. If it feels too risky, you can always choose not to sync the passwords.